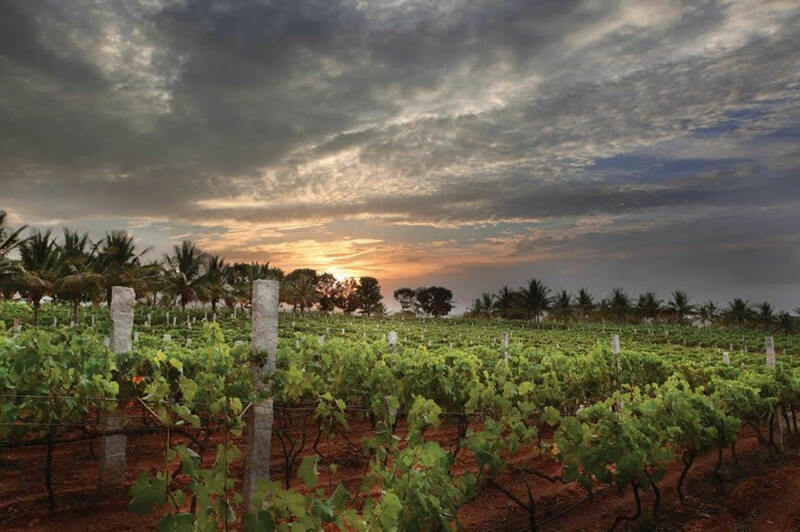 A pioneer in sustainable practices, Sula continues to take pro-active steps in wine production, finding solutions to the challenges created by climatic change. It anticipated the effects and took action pruning the vines as earlier than ever before- in August this year. As a result, the harvest started earlier on the 13th of December for Vintage 2017. This harvest has been the earliest since Sula started winemaking. 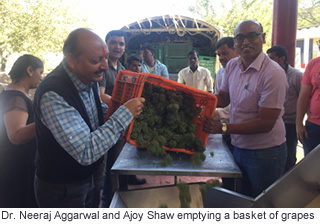 Ajoy Shaw, Chief Winemaker of Sula, who has been working with Sula from the beginning says, ‘we have always reacted pro-actively to climate change. This year we pruned the vines as early as mid-August, resulting in early ripening of the grapes. This is our earliest harvest ever in 19 years with the grapes having crisp acidity and great flavours.’ He is optimistic and excited about this vintage. ‘It’s not that we just went ahead for early pruning this year,’ asserts Neeraj. ‘We have been learning from our experience and have realized that earlier pruning can give better fruit and thus advancing the pruning of many of our plots gradually. The risk of rain is there, of course but we have technology behind us now and the farmers are constantly been educated how to handle diseases. For instance, our harvest season used to start in mid January and spill over till mid April. This year we have reached mid December for the beginning and will finish the harvest by March- end,’ adding that this year in early December the temperature went down to even 10° C which is very good for the freshness and crispness. Considering all the factors including the earlier drought, Sula would be crushing 12,000 tons of grapes this year as compared to 13,000 last year. This implies that there could be a dip into last year’s stocks and perhaps shortage of product for the next year sales. ‘The balance of grapes that need longer ripening period will be harvested between February and March once they achieve required Brix level,’ says Mandla. York Winery which is 2 kms down the road from Sula has not experienced an early harvest. ‘Simply for the reason that our vineyards are not located in the area where early pruning is possible due to the absence of rains,’ says Kailash Gurnani, the winemaker and co-owner of York. ‘In fact due to the drought earlier this year our yields came down by 30% and in some plots the whole fruit got wiped out,’ he adds. Kailash is optimist about the quality of the crop though. ‘We have had good monsoon, in fact excess rain means the soil is now carrying enough water so the next year there would be no water problem. They plan to have the harvest at the usual times-from Jan to Mar. Despite the loss due to drought, his brother Ravi Gurnani feels ‘we should be able to crush around 400 tons compared to 360 tons last year. This is possible because of new contract farmers coming on board. Kailash expects the production of 300,000 liters (appx. 33,000 cases). Kailash agrees that by early pruning in August, one can have better fruit when harvested earlier; but rains are a factor to consider. He also agrees that the fruit harvested in December would be ripe with fresh and crisp acidity. 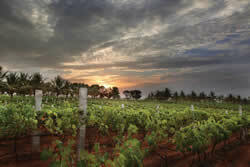 York has also realized that Cabernet is not the ideal grape to grow in the Nashik. ‘We plan to gradually move away from this grape variety as we are growing other grapes like Tempranillo which we planted a couple of years ago. This grape will be used in the blend this year but we also plan to produce a single varietal soon. 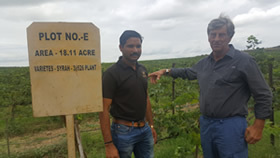 (delWine has been advocating more planting of this grape for years , because it is a warm climate grape and because the earlier results saw excellent wine from Tempranillo by Charosa and Grover Zampa at their Nashik vineyards. Chardonnay has been also planted to be used in blends as well as in single varietal wine in future. Global warming has affected Fratelli in a different way causing unusual drought. Alessio says, ‘Global warming has affected us with drought that we faced from March -June 2016. We had been obliged to postpone our March pruning due to lack of water in some plots. Therefore in 2017 the harvest time will be more stretched out than usual. Our harvest in Akluj usually starts early in Jan and finished latest by the first week of March. I am afraid this year we shall see it finish only by March-end. Situated far from the maddening crowd, KRSMA was also a victim of the drought for the current vintage but expects excellent quality of fruit. I caught up with Uma Chigurupati, the co-owner and winemaking decision maker for KRSMA in Chennai. ‘We have been badly affected by the drought this year. Where we were getting 1.5 tons/acre earlier, we could manage less than half,’ she says. Although there harvest started earlier this year, partly it has been due to early ripening. ‘Our Sauvignon Blanc normally needs 120 days after pruning but this year it took 100 days only and the fruit is stunningly beautiful’, she says. Harvest 2017 brings forth the vagaries of Mother Nature and a reminder that wine is a natural product and we must learn to respect the nature, which ultimately controls our destiny-at least for wine production, making it a unique product, distinctly different than liquor. 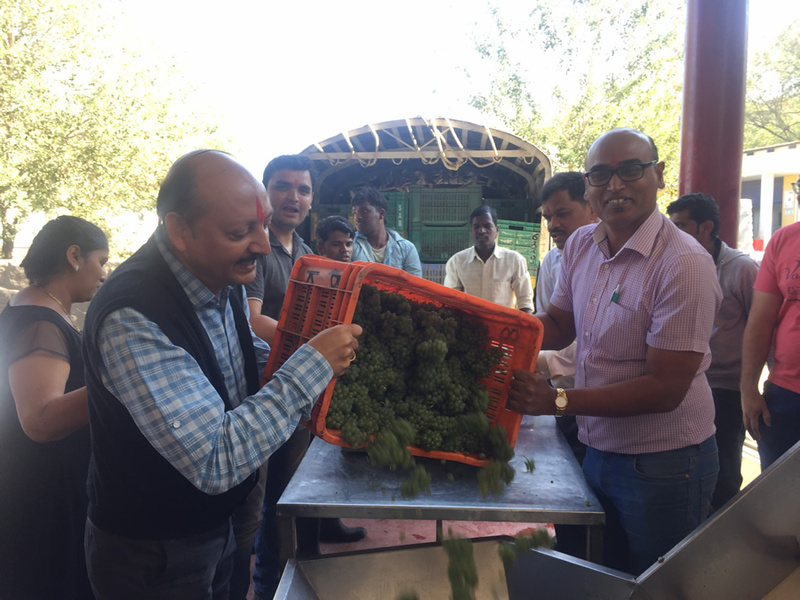 Besides, the wine industry has been responsible for remarkable growth in rural employment and rural incomes ever since Maharashtra unveiled the first progressive wine policy in 2001. That should leave something to think about for our bureaucrats, politicians and other decision makers. Glad to know the details of Vineyard and Harvest report. I like to know what is the time of grapes . I like to visit any vineyard and wineries in the 1st week of October 2017--- can I get permission to see those? In the 1st week of October , can I see grapes in vineyard? Please reply soon.